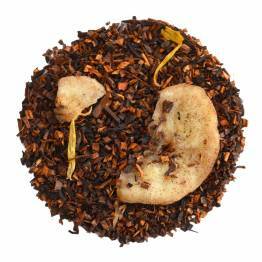 A rich and chocolatey red rooibos infusion. Inviting and rich, the warm smell of chocolate greets you as you open the tin and settle in for a cup tea. 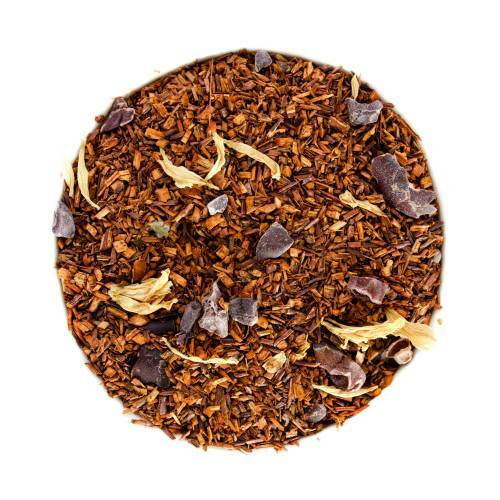 A rich and smooth blend of rooibos and cacao, this tea is a refined take on the comforting feeling of sipping hot chocolate on a cold day.The cacao tree is native to the Americas. It may have originated in the foothills of the Andes in the Amazon and Orinoco basins of South America where today, examples of wild cacao still can be found. The cacao bean was a common currency throughout Mesoamerica and the Caribbean before the Spanish conquest. The cacao plant was first given its botanical name by Swedish natural scientist Carl Linnaeus in his original classification of the plant kingdom, who called it Theobroma cacao, or "food of the gods". *Red Chocolate has changed! We recommend ordering a sample to taste the difference. Please send us your feedback, we would love to know what you think. Have you tried Red Chocolate? Tell us what you think! Comforting and satisfying…with a hint of chocolate.. This is my number one favorite Rooibos tea. This tea has become part of my personal evening ritual. I prepare by steeping for 3 mins in my tea press than add 1/4 cup of frothed low fat milk. This tea is wonderful after a long day, helps relax my mind and body. The aroma is so calming and it has stopped my late night cravings. Smells wonderful, and has a nice subtle, sweet, smooth, chocolatey taste. I drink it almost every day now. By far one of my favorites. I don’t really get the same chocolate taste from this tea as I have found with other chocolate teas, but it is still tasty in its own way. Don’t love it, don’t hate it. I like this one with a little milk and honey. Really good and healthy way to keep you awake. Gets me through my Monday, week after week - something to look forward to on the way to work.